Welcome to the All My Movies™ Press Center! Here you will find up-to-the-minute news and information for journalists, reporters and anyone interested in digital image processing and multimedia technology. This information is for vendors interested in distributing Bolide Software titles on cover CD/DVD, web-sites, online services, online magazines, user groups. 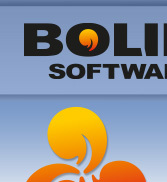 Our distribution policy allows vendors to re-distribute trial versions of all software titles produced by Bolide Software. Original installation files should not be modified in any way and should come in the form they are available at download page. Jan, 2004 -- Organize your movie collection now with All My Movies™! Mar, 2005 -- Where are my movies? This program knows the answer! Mar, 2005 -- in German! Wo sind Ihre Filme? Dieses Programm kennt die Antwort! The bigger logo for offline publication is available too. The bigger splash screen for offline publication is available too. The bigger box shot for offline publication is available too. Please use our feedback form to ask us any questions or requesting a copy for the review. "Great program for keeping your movie database updated. Highly recommended!!!"